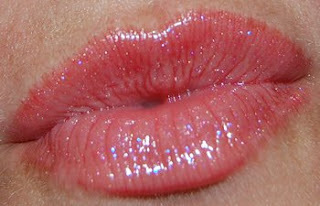 I love, love, love this lip gloss! And let me tell you, I've tried them all (almost)! First of all, I've realized that I much prefer a wand to apply lip gloss than a tube. With a tube I always squeeze out too much gloss, and when I try to prevent any mess, I squeeze out so little that it takes me 5 squeezes to finish the job. With a wand is so much easier! 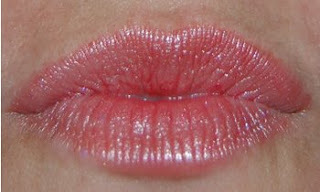 So why do I like this Pop Gloss Crystal by Givenchy? Because it has the right stickiness, it doesn't have any weird flavors nor scents, and it has pretty good staying power. And an amazing selection of colors! My favorite one is number 416, Glitter Pomelo, and when I first noticed it, I had to buy it! As the name suggests, it has glitter in it, but not just any pink glitter... it has bluish/purple glitter, which looks so cool against the pink gloss! First of all, with a lipstick base the lip gloss will stay on longer, as opposed to wearing it directly on your bare lips and eating it away in 5 minutes. Also, instead of throwing out a lipstick I don't like anymore, I always try it under different shades of lip gloss now, to see if I will change my mind about the lipstick. And this is exactly what happened to my Chanel Antigua lipstick, because thanks to Glitter Pomelo it didn't end up at the bottom of the trash can! This is Antigua alone. Nice looking, but too flat and frosty for my taste. So I used Pomelo on top of it and voila'! A much younger looking color, with added depth and sparkling (not frosty) shine! I love the combination! And these two guys are always together in my bag now. 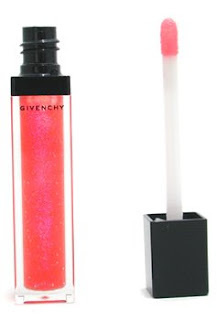 The only negative thing I can say about this Givenchy lip gloss is that after using it for a while it can turn messy at the cap twist, since some product always seems to escape, so you need to clean it off every so often. But other than that, it's just perfect!